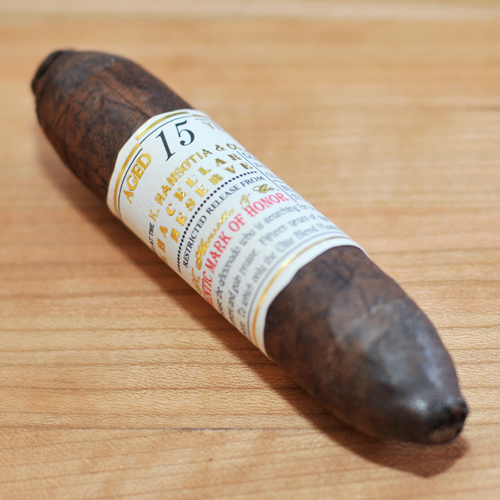 The vintage Cellar Reserve uses the finest quality 15 year-old aged tobacco, comprising of an oily Criollo wrapper that was harvested in 1998. It is combined with an aged Dominican, Olor binder and then a 15-year old Dominican filler. 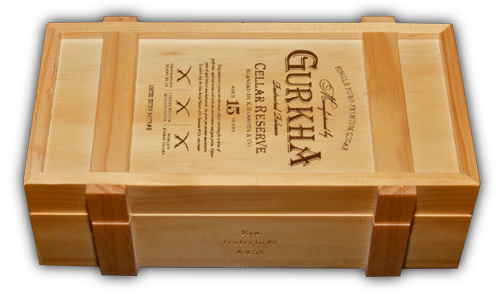 The cigars are also housed in a unique wooden box which Gurkha claims is aesthetically evoking of a maturing wine barrel. 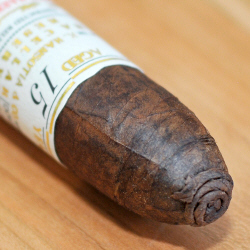 This is the 2nd Gurkha reviewed by Cigar Affection and the vitola I am smoking for this review is the Koi Perfecto #2. This Gurkha Cellar Reserve Koi Perfecto #2 has a length of 102mm with a ring gauge of 58. Yes, this is a short little fat cigar, but don’t make the mistake and think it will be a quick smoke - it will keep you busy for way more than an hour. Each cigar is packed in a cellophane wrapper and once you take it out you will smell pepper, chocolate & vanilla. 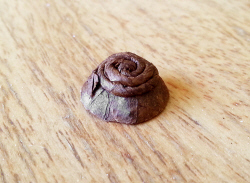 Also take some time to adore this beautifully crafted cigar with its spiral pigtail cap. 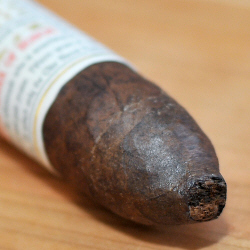 The foot is tapered and overall there is not anything to fault on this cigar. There are hardly any veins present and it feels special to hold a cigar in your hand that is made from tobacco that has been aged for 15 years. The label is huge for such a small cigar and I can’t help to wonder if Gurkha tried to resemble a wine label - even the paper is of a similar texture to some wine labels. It sure looks good. Off with the cap - the pre light draw produces grassy, woody and mild tobacco flavours. Let me light her up! From the first draw I am immediately greeted with strong earth combined with salty leather. 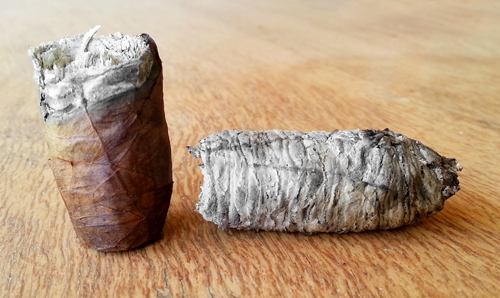 Even though the cigar is tapered at the foot, the draw is not too firm and I don't have to fight to get it going. Huge plumes of thick lush white smoke fills the air. This little Gurkha really is a big smoker! Just when the foot’s tapered tip is burned out and the full gauge thickness is reached, the draw opens up and gentle white pepper becomes apparent. Leather is still the dominant flavour. The strength also takes a step up the ladder at this point. As you progress through 1/3 no new flavours makes it appearance and it stays in the same dimension but delicious nonetheless. Towards the end of 1/3 hints of cocoa emerges topped with a very gentle spice on the finish. The leather slowly disappears and is replaced by a gentle cedar wood flavour. So far all flavours except for the leather in the beginning are very subtle. The aroma is that of sweet earthy tobacco. The draw is perfect and no issues with the burn line either. Into 2/3 the leather returns with an earthy undertone whilst the cedar and cocoa on the back palate remains ever present. Halfway into 2/3 the spicy white pepper lingers on the mid palate with a much darker earthy undertone still combined with cedar wood. The strength increases yet again. As you can see from the picture above - the ash is solid as the earth's foundations and this is testimony to how well this cigar is manufactured. Up to this point the burn line is nearly razor sharp. Approaching the end of 2/3 the spice subsides with only earth and cedar remaining. Cocoa is still faintly present on the back palate. 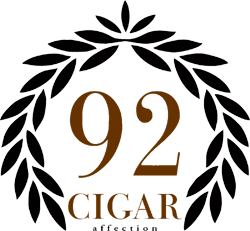 Strength is ever increasing and the cedar wood becomes darker while remaining the dominant flavour with a toasty and woody aftertaste that remains on the palate. Into 3/3 the cocoa makes a welcome return on the finish and lingers for quite a while. On each draw, which is getting hotter even though I'm smoking slowly, the spice increases while cedar wood is still strongly present. Halfway into 3/3 the cedar wood subsides and only earthy tones remain. After the ash breaks for the first time the flavour profile changes to earthy and toasty flavours with hints of minerals and not much more that is worth mentioning here. The Gurkha Cellar Reserve Koi Perfecto #2 can easily become one of my preferred cigars. It is a well-constructed and pleasant cigar to enjoy with flavours of leather, cedar, cocoa and earth. It is a fairly complex smoke but not to the point that it will shake your foundations and it stays consistent with the flavours remaining in one place for an acceptable amount of time. In the end the burn line got a little crooked but that is hardly of any concern. 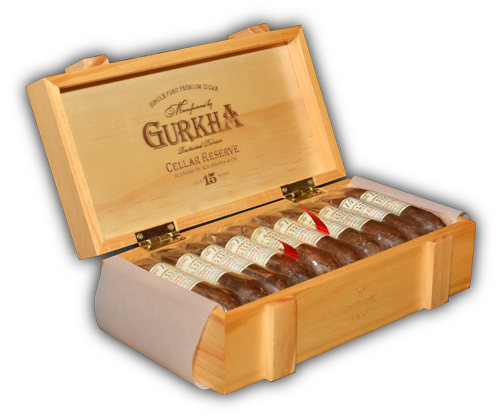 If you are looking for a good cigar with vintage qualities then welcome to the world of the Gurkha Cellar Reserve! Review weather notes: Mid afternoon, 25°C with scattered clouds and no wind. flavour/taste (40 points) and an overall satisfaction rating (20 points). There are no comments yet. 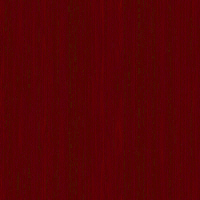 Be the first to write a comment.